These famous words of the German philosopher Friedrich Nietzsche are often applied to different situations. For Dave Ostrowski, this phrase has been the guiding principle of his adult life, as he continues to serve as a role model for the youth of his community through the game of basketball. Ostrowski has lived the past 13 years with IgA nephropathy, an autoimmune kidney disease that occurs when the antibody immunoglobulin lodges in the kidneys. The disease, more commonly known as Berger’s disease, hampers the body’s ability to filter wastes from the blood. It currently has no cure. He was born with the condition, though it does not begin affecting someone until the ages of 18 to 22. 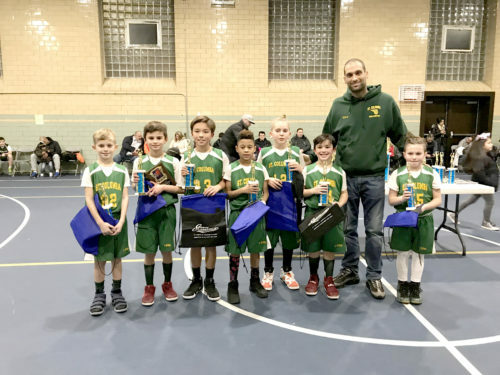 Despite his diagnosis when he was 19, Ostrowski has passionately coached Catholic Youth Organization (CYO) boys’ basketball at St. Columba, Marine Park. Coaching has been exactly what he’s needed to take his mind off the disease. The Marine Park native and St. Columba parishioner played CYO hoops at the parish before moving onto James Madison H.S., Homecrest, as a power forward on the basketball team. He began coaching CYO as a freshman at Kingsborough Community College in Manhattan Beach. Over the years, he has coached third through 10th grade at St. Columba, often coaching two teams simultaneously. He typically moves up each year with the same group of players until they graduate out of the program. For his older CYO team, he coaches the same kids in the Amateur Athletic Union during the summer. In 2011, Ostrowski joined the Gerritsen Beach Fire Department, where he worked his way up to an active lieutenant. As for his kidney disease, he monitored his status every six months and was able to live a relatively normal life. However, last year the disease began progressing aggressively, so much so that Ostrowski had to go on medical leave from the fire department. Doctors told him he would need to undergo surgery for the insertion of a dialysis port in his abdomen. Ostrowski had his surgery several weeks ago and began the process of peritoneal dialysis, a treatment for kidney failure that uses the lining of his abdomen to filter blood inside his body. Thanks to advances in technology, he’s been able to do dialysis treatments at home during his sleep. Through this entire process, staying positive has been the key for Ostrowski, and coaching CYO has been a huge help. He’s able to enjoy something that he loves while placing the focus on basketball, rather than his plight. In fact, he loves coaching so much that just four days after his surgery, he was back in the gymnasium cheering on his team. The coaching also had its physical benefits for Ostrowski. His doctors were amazed that despite his kidneys operating at less than 10 percent each, he was able to function somewhat normally. Ostrowski has left a lasting impact on the hundreds of kids he’s coached. He will always be grateful to this year’s fourth grade St. Columba team, which had the idea of helping their coach with his surgery costs. His mother Patricia started a GoFundMe page online, and within a week, the family received more than $10,000 in donations from over 100 donors – many of whom are parishioners at the church. He has devoted so much time into making a difference in the community, so donating to his cause served as a means for his former players and their parents to show their appreciation. It’s the least they could do for someone who has led by example on and off the basketball court. The next step for Ostrowski would be getting a kidney transplant. He will continue dialysis treatments until a donor comes forward. In New York, the wait list to receive a kidney from a cadaver is upwards of seven years. “Getting the word out there is really more important than anything, because a live donor is the way to go,” Ostrowski said. If you are interested in possibly becoming a potential donor, you can contact the nonprofit organization Renewal at 718-431-9831, Ext: 209. Then mention Reference #23473 and the name David Ostrowski. To donate to the cause, visit Ostrowski’s GoFundMe page: gofundme.com/davidostrowskisurgeryfund. His kidney disease has undoubtedly made him stronger. And he’ll now rely on that strength every day as he awaits a donor.